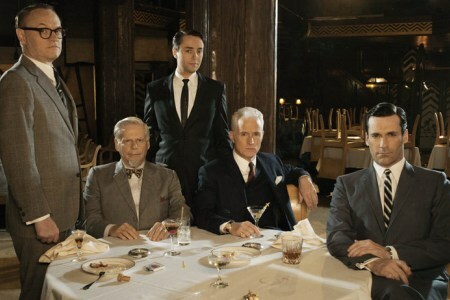 So, Mad Men Season 4 began last night – watched, one imagines, by hundreds on BBC4. For those of us who’ve been with it from the start (and I don’t mean that to sound superior; I’m very rarely in at the ground floor with the best US imports, as you’ll know from past experience with The Wire, Battlestar, Curb, 30 Rock and, most conspicuously, House), the current media hoo-hah seems a little after the event. In fact, if I’d been watching it for the very first time last night, not having seen it before, I might even have wondered what the fuss was all about. Sure, it looks pretty, and the 60s setting is interesting and the suits well cut, but who are these people with rods up their arses, and why should I care if they win this account or lose that one? Well, rare indeed is the TV show that can live up its own hype. For my money, and I speak as an early investor, the first episode of S4 was dazzlingly clever. My heart was in my mouth on more than one occasion, and if it hadn’t been so late, and I didn’t have that stupid Derren Brown hoax to watch, I could easily have watched it all over again. They’re so finely polished these episodes, it would be a shame to delete them. They go on giving. In breaking up the old Sterling Cooper, gradually, throughout S3, and re-established them at the bottom of the food chain, in an office with only a fabled second floor, the creators have been able to a) position Don Draper at the very apex of the business, where he always belonged, with his own “D” in the company initials (as Peggy said, those who jumped ship with him, did so because they love him), and b) cut away some of the dead wood. I’m sure we’ll see Sal and Kinsey again, but for now, it’s nice to have the sprawling cast cut back. Joan, so central to the hype – or at least Christina Hendricks has been – barely spoke in this episode. Not that her presence was reduced. The look on her face when Don sent the “two-piece” clients packing spoke volumes. But again, if I’d believed the hype, I might have assumed that the statuesque Joan was the star of Mad Men. She’s not. Never was. But she always felt like an essential internal organ, and, like so many of the supporting characters, has been fleshed out immeasurably over three seasons. Oh, and she has much bigger breasts than most women on telly. Don’t know if that’s been coyly referred to at all? Oh. Here I am, adding to the chatter once again. If you watched the programme for the first time last night and wondered what all the fuss was about, then please do yourself a favour and get the first, second and third seasons somehow. Borrow them, whatever. Mad Men has earned what it’s doing in Season 4. But you have to appreciate the breakdown to understand and enjoy the rebirth. “Who is Don Draper?” is only a profound question if you think you already know the answer. But even those of us who think we do, we didn’t know he liked a bit of that, now, did we? I’ve blogged about Mad Men here before, but only briefly. Once here, and another time here.